This very spacious, luxurious and comfortable villa is located not far from the center and the beaches of the very lively and popular coastal town of Albau. 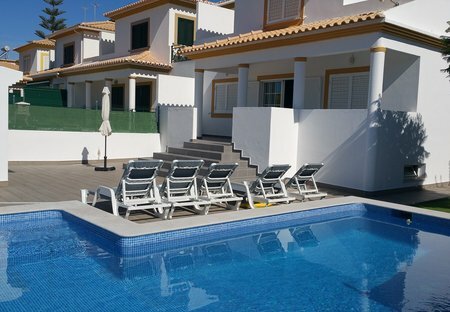 Villa Ambar is located in Albufeira, Algarve. This detached vacation rental property sleeps up to 8 people with 4 bedrooms, 3 bathrooms along with private swimming pool. Spacious air conditioned 2 bedroom apartment with sea views, perfect for a family or group, close to Albufeira Old Town and just 500 metres to the beach. Shared pool and secure parking. Beach Villa Barreto is located in Albufeira, Algarve. This detached vacation rental property sleeps up to 6 people with 3 bedrooms, 2 bathrooms along with private swimming pool and sea views. Beautiful and spacious villa, cable tv, free wifi. Air conditioning on the top bedrooms 4 bedrooms, 3 ensuite. 2 kitchen´s This villa is located in a quite area but close to the busy Albufeira. Ideal location for a holiday. T0 Point has the capacity to sleep 4 people. No need to worry about getting out and about as everything is so close by and the property is fully equipt too. Villa Coelho is located in Albufeira, Algarve. This vacation rental property is air-conditioned and sleeps up to 6 people with 3 bedrooms, 4 bathrooms along with private swimming pool.